With the blessing of temperate climates and nearly year round growing conditions, the south is a breeding ground for impeccably green lawns. Colleges here, while noted for their football programs and tailgating, are also noted for their stunning campus landscaping. In the past few weeks, LawnStarter has looked at the best landscaped colleges in Midwest, as well as on the East and West Coast. This week, we focused our efforts on the charming Southern parts of the US, bringing you the best landscaped colleges in the South. We’ve inspected hundreds of photos, interviewed students, alumni, and faculty, and scanned message boards to bring you this list. The criteria we used for ranking includes the amount of green space on campus, the prevalence and uniqueness of landscape installations, and the attention given to lawns and landscapes on campus. Here’s to hoping your school made the list! You may not realize it, but the ‘A’ in A&M actually stands for ‘Agricultural’, so it’s natural that this school takes their plants seriously. Located in College Station, TX, the school is a top-notch public research University that is famous for its football program. It’s also gorgeous, thanks to its excellent grounds crew. Walking around campus, you’ll see that they truly take pride in their campus lawns. Furman University may be a college campus, but it feels more like a sanctuary. Complete with fountains, exotic plants and of course, well-maintained lawns, Furman is undoubtedly one of the best landscaped colleges in the country, let alone the south. Atlanta, not typically known for having an abundance of green space, is home to the beautiful Emory University. A quick walk through campus (and it’s small, so it will be quick), and you’ll forget that you’re really in the middle of a concrete jungle. 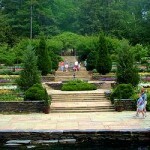 Its sheer proportions of green space and its excellent maintenance put Emory at #8 on our list. You’d expect a huge University in Orlando to be beautiful. And you’d be right! The University of Central Florida not only bucks the metropolitan trend of concrete with its copious green space, but its landscape installations are unique and awe-inspiring. For that reason, UCF’s massive campus lands at #7 on our list. Looking for lawn service in Orlando? Check out our Orlando Lawn Mowing page. A small private college located in Lakeland, Florida, Florida Southern University is a gem to be admired. First, it is home to the largest collection of Frank Lloyd Wright architecture in the world, which is certainly notably. It is also listed as a historic district and has topped many lists of the country’s most beautiful campuses. 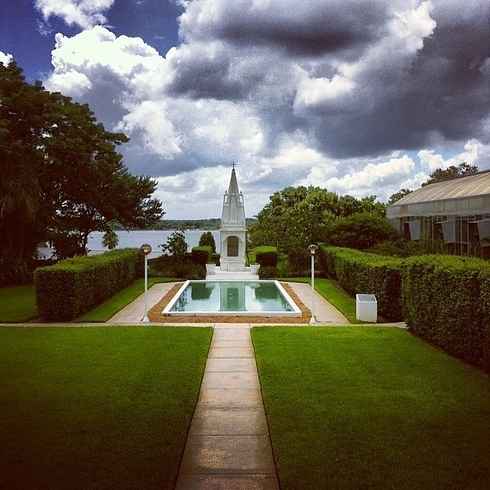 Finally, the Evelyn and Warren Willis Garden of Meditation (pictured above) is an ornately landscaped and unique addition to campus, one that lands it at a well deserved #6 finish. Another concrete metropolis, Dallas, gives birth to our #5 college, Southern Methodist University. Topping many academic lists, SMU is also a clear example of amazing landscaping. Their main lawn is an exceptional display of turf with beautifully designed walkways, and it is expertly maintained by the campus’s grounds crews. Live in Dallas? Check out the lawn care services we offer in Dallas. Florida State University dominates landscaping the way it does the football field: with elegance and unique style. Either hated or loved by football fans everywhere, there is no dispute that FSU is a top-notched school when it comes to landscaping and lawns. Located in Tallahassee, the campus displays vast amounts of green space (notably Landis Green), and the expert maintenance of the grounds crew lands the school at #4. Home of the Georgia Bulldogs, the University of Georgia is a stunning place. Resting on 759 acres of land, UGA is adorned by many flat green areas and intricately designed flowerbeds. Known as a “Southern Ivy,” and located in Houston, TX, Rice University sure gives East Coast Ivies a run for their money in terms of the attention they put into their grounds. Check out the quad pictured above and revel in its perfectly edged lawns and the brilliantly trimmed bushes. 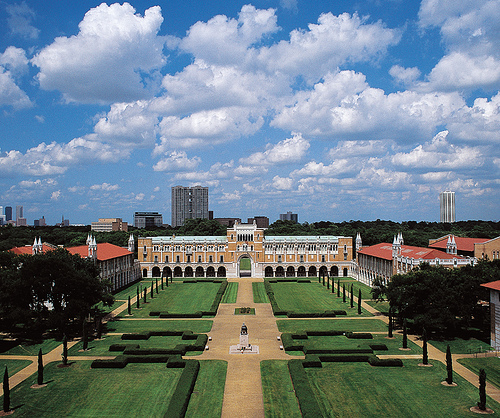 Without question, Rice is one of the best landscaped colleges in the nation. Though it has a small student population, Berry College (located in Rome, GA) boast 27,000 acres of land, claiming to have the largest contiguous campus in the world. Most of this land consists of fields, forests, and Lavender Mountain, but a significant portion is ornately landscaped like the picture above. Also, note the crystal clue pools and properly placed shrubs and plants. Gorgeous, right? For these reasons, Berry College is well deserving of the #1 best landscaped college in the south. Did we miss your school? Comment or email us to yell at us and tell us what a massive mistake we made. LawnStarter makes lawn care easy. In only a few minutes, you can get a price for lawn mowing and book a lawn care professional near you. Scott is a research analyst and writer for the LawnStarter blog. He's a lawn care expert, avid gardener, and dog lover.